Free your self of wires. Sounds like a dream. But with the 150ft range of the AW825 speakers, that work inside, outside, in the rain and wind, you’ll be able to live that reality. The base unit does have to be plugged into a wall outlet and a source via the 1/8th adapter, so your MacBook, your iPod, iPad, iPhone, laptop, or stereo, but the actual speakers run on AA batteries and can be moved anywhere. Each speaker is sold separately, but you can add as many as you like. Users with 4 have experienced no issues. Each speaker can be set to mono, left channel, right channel. You can place them through out your home, garden, or pool area. The speakers themselves run at 5W and are a two way design. A 2-inch tweeter and 3-inch woofer. With a 40Hz-15kHz frequencies range. You can control volume of each speaker, but track control, fast forward, shuffle, etc, have to be control at the source. But if your computer, stereo, internet radio has an iPhone application you won’t have to leave the party to skip over or turn up the jams. You can plug in the speaker as well, if you do place it near an outlet so you won’t be burning though AA batteries. And each speaker comes with a 1-year limited warranty. The AW825 is very plug and play friendly. The copper colored metal exterior is a fashionable match to a craftsman style or Victorian homes. 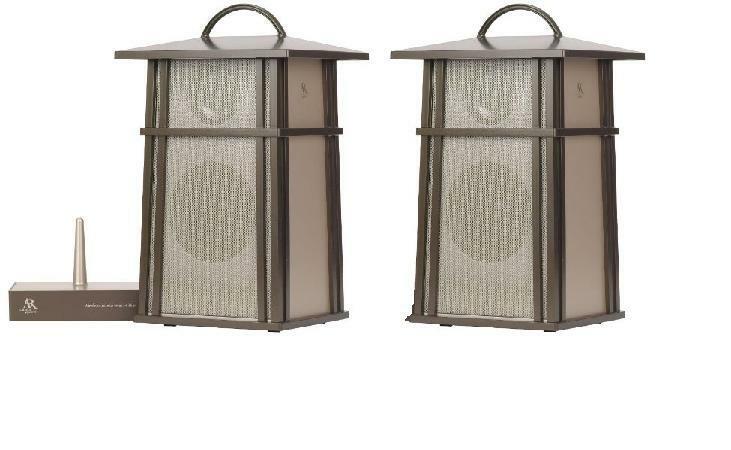 According to the reviews these Acoustic Research AW825 speakers actually sound pretty good. With a frequency down to 40Hz you are sure to get some good amount of bass and topping out at 15kHz will remove a lot of irritating high frequencies, if you are lucky enough to hear that high still. Of course with any wireless device there can be interference coming from other electronics running at or near the 900MHz frequency the AW825 run at. Really the only negative remarks are about static interference. So if you get some – check around for what the source could be. Otherwise enjoy your music around your home, garden, while camping, or anywhere else.